TL;DR: It's fine, I suppose. I guess. Whatever. Are you a mycophiliac and sick of the fact that nobody in the tabletop gaming space seems to be catering to your appetite? Well, look no further! Here’s a game that will finally give you a chance to show off what a fungi you are! This is perhaps the perfect game for someone with such interests, because it’s also a very small box and doesn’t take up mushroom! Maybe it’ll be exactly the thing you need to encourage your friends to take a lichen to gaming! Try not to force your enthusiasm on anyone though because there is a morel way to do these kind of things! I’m sorry. I’m so sorry. I’m just… I’m just so sorry. Right, now that I’ve gotten that unfortunate urge out of my system let’s talk about Fungi. It’s also known as Morels depending on the version you have, but aside from I think some component differences the games play identically. 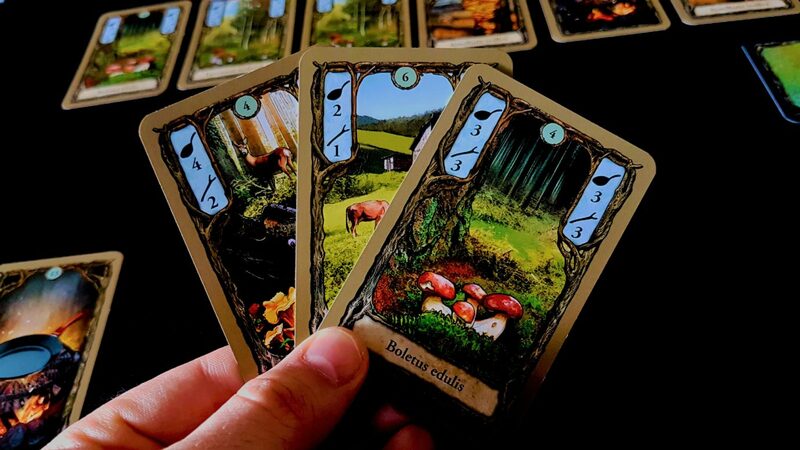 This is a very straightforward, very simple card game for two players in which both of you are attempting to pick the tastiest, most succulent mushrooms from the forest that surrounds you. You’ll be frying them up, perhaps in butter or cider, with the intention of earning the deliciousness points that will earn you victory in the final reckoning. In the Game of Spores, you win or you – well, I guess you just don’t win. On your turn you’ll be doing one of five things. When you gather a set of three mushrooms of the same kind, you can fry them up – if you have a pan played out in front of you. If you have two or more in a set, you can trade them in for foraging sticks that will let you explore a greater proportion of the forest ahead. If you have a pan in your hand, you can play it down for later use. You can take a card from the forest ahead of you, or you can gather up all the cards that have ‘decayed’. This can be a powerful move, but it’s hard not to think of it being essentially scooping up the rotting remains of substandard mushrooms in the hope you can salvage a passably edible meal out of what remains. 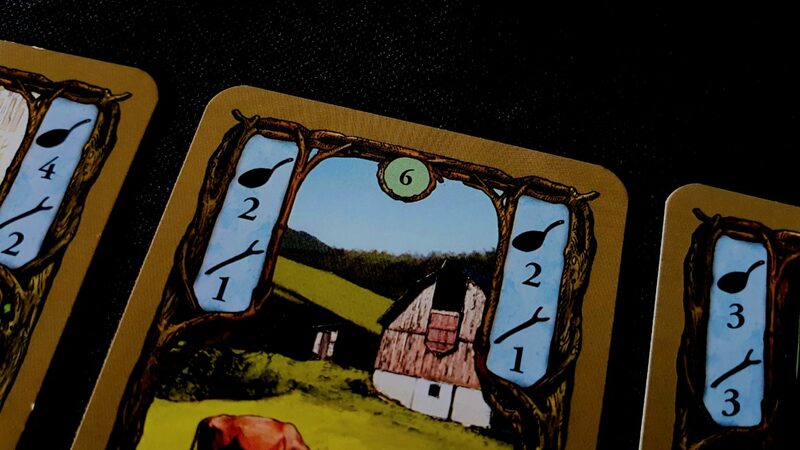 The forest is made up of eight cards which are constantly replenished from the draw deck. 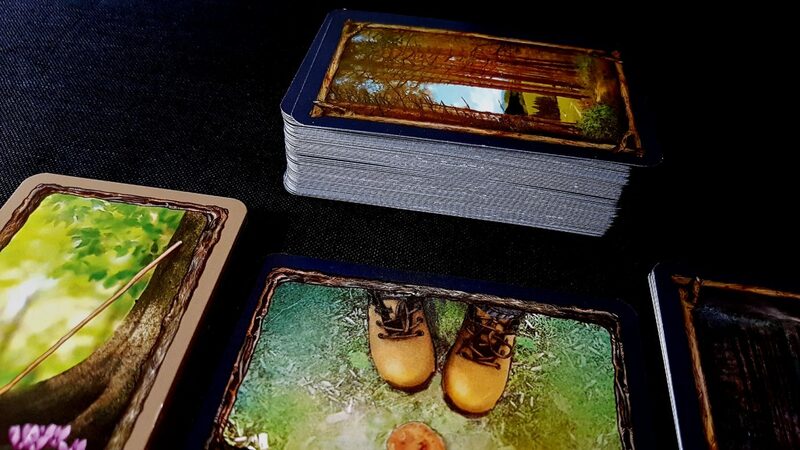 The feet represents the ‘immediate area’ of the forest and the two cards in front of the feet are free for anyone to draw if they want to pick one up. To go farther along the forest, where there may be less competition and choicer opportunities, you need to spend foraging sticks. If you wanted the last card in the forest, you’d need to spend six sticks to get it. To get those sticks, you’d need to sell enough mushrooms to generate them. It is costly to go too deep into the forest. And rightly so because Fungi has some weird thematic elements that make it an altogether surreal experience if you care to actually think about it. One of the things you might forage is a pan that you can use to fry up mushrooms later. Why… why is this a forest where pans are growing freely in the wild? Perhaps we’re in an Alice in Wonderland situation. Or more plausibly, picking mushrooms in a forest full of heroin addicts that are getting so drugged up that they’re losing their cooking paraphernalia. In either case, I think we have justifiable cause to be wary of the darker parts of the forest. We begin the game with a pan of our own which will disappear when we use it to cook up mushrooms. We don’t mess around when we cook these things – clearly we’re making use of some industrial forge instead of a conventional cooker. I have cheapo frying pans that have lasted a decade, but maybe I just don’t understand how hot mushrooms have to get to be enjoyable. A mushroom risotto cooked in the world of Fungi is clearly served at a temperature high enough to inflict second degree burns at a distance. We also begin with three cards that represent the current basket of treats we’ve collected. We begin in media res, as it were. We start play with a hand limit of eight, but get a chance to increase it as time goes by in another weird thematic quirk of play. We’ll talk about that in a little bit. And then we ‘decay’ the card to the rightmost edge of the forest. The decay pile can hold as many as four cards at a time – when a fifth is added, everything else is discarded and a new pile is created. 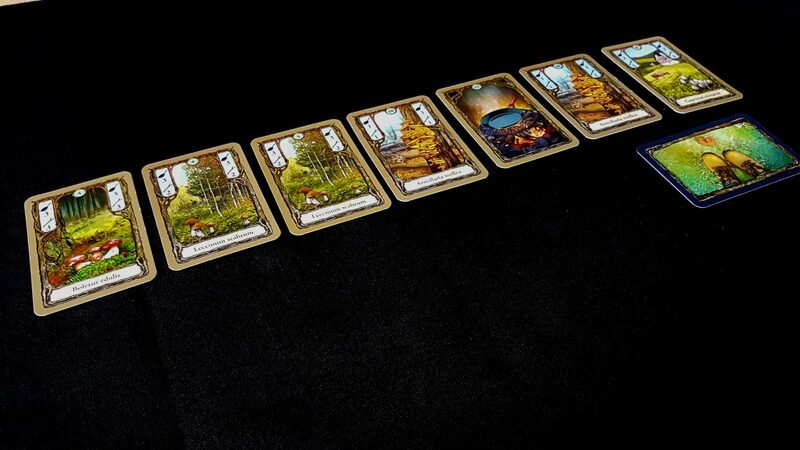 At the end of our turn we replenish the forest back up to eight cards, representing us travelling farther and farther from the familiarity of home and easy availability of police and other authority figures. The cards we select all have their own individual charms. Some are especially tasty, and frying each will give a colony of points to the lucky player able to grab them. Some are especially valuable in the shadow economy of mushrooms that exists in the forest, and cashing those in will yield greater numbers of sticks. Some mushrooms are just really easy to gather – common and bland, but available in the quantities needed to all but guarantee they make a set. Your hand limit is intensely restrictive – you get few opportunities to discard what you have collected if you have spread your attention too thinly. A good mushroom forager is selective. Two deliciousness, worth one stick, and there are six in the deck. Once we’ve taken our turn, our opponent takes theirs, and then we take ours, and so on. As play goes on, we may find ourselves eyeing up the decay pile for easy opportunities, but always being mindful of the fact that we take all the decay pile. If we can’t do that then we can’t take any. We’ll find ourselves regretting our early optimism as valuable mushrooms we really wanted end up being picked by our opponent because situations demanded we picked something else. We only win by frying mushrooms, but it takes mushrooms to make mushrooms. Sometimes you’ll want to discard a potentially valuable set just for the sticks it’ll give you. Being the first person able to collect lucrative options at the far end of the forest can be worth it in the long run, assuming you’re able to gather them up in sufficient quantities. 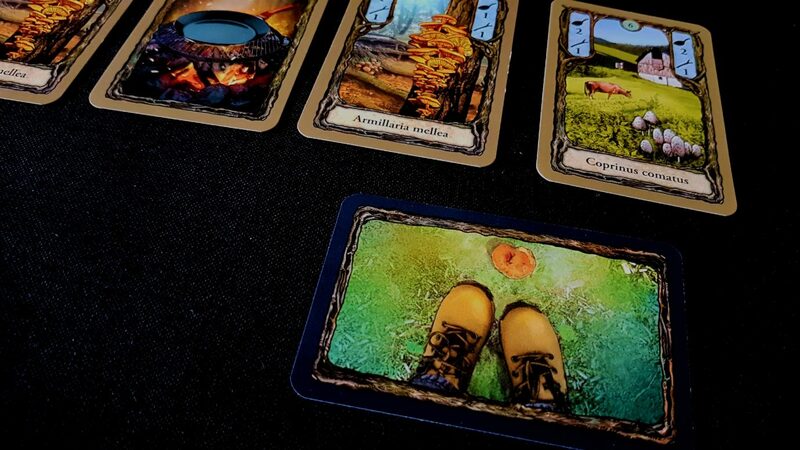 There’s a limited number of each mushroom in the deck, and if you missed an early opportunity you may find it a risky proposition to buy in to the pot at a late stage. What kind of freaky forest is this? Yes, not only does this forest have wild pans that are free for the taking, it also apparently grows rich crops of butter and cider. These are acquired in exactly the same way as your mushrooms, suggesting forcefully you’re stealing stuff directly out of kitchens as you saunter past. Or perhaps that you’ve spent so much time lost in the forest that you’re fermenting your own apples and churning your own butter. Perhaps you’re one of the Famous Five, and went into the forest equipped with lashings of cider. In either case, these are cards you pick up as potential score bonuses. If you cook four or more mushrooms at once, you can add a dab of butter to gain an extra four points. If you cook five or more at a time, a dash of cider gets you an extra five for the set. Crime absolutely does pay in Fungi. If you want to avoid being caught red handed, eat the evidence. Weirder still are the baskets that manifest occasionally – picking one of these up results in it going straight in your display area, and each basket you have will increase your hand limit by two. But where are the baskets coming from? Perhaps you’re not stealing cider and apples from kitchens, but you’re Yogi Bear stealing picinic baskets from otherwise happy campers. Maybe the end of Fungi isn’t in the scoring of mushrooms but instead in the bullet the weeping park ranger eventually fires into your feral animal brain. 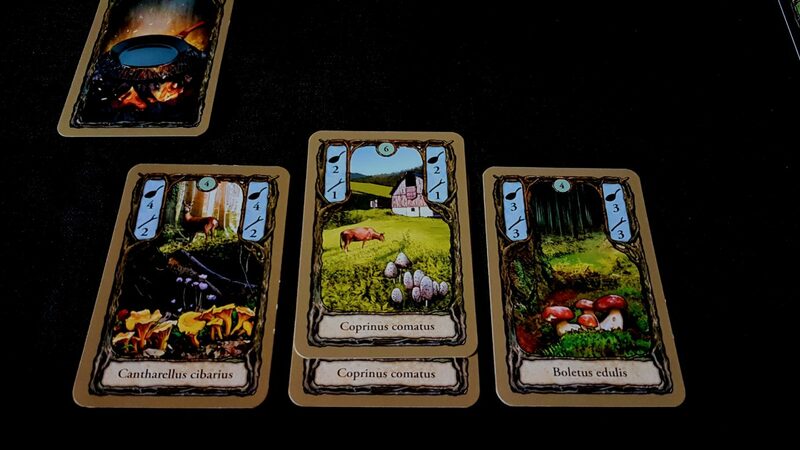 Sometimes you pick up a moon card, and this permits you to draw a card from the ‘night deck’ – these are otherwise normal mushrooms that count for two when you fry or sell them. Rather than having to collect three normal cards, you can use a night card and a day card to make up the balance. But what does that even mean in the context of the game? Remember, the forest path represents distance and not time – you can pick up night mushrooms and day mushrooms according to their own temporal rhythm. How does the day and night cycle work in this place? Are we wandering into faerie circles and being transported to alternate dimensions? Are we passing out and coming to at irregular intervals? Are we foraging for our survival, rather than our enjoyment? What is it that makes these ‘night mushrooms’ so much more valuable than day mushrooms? And what of the baskets – they let you hold another two cards. How big are these mushrooms? Or, how small are these baskets? What on earth do time, space and relative proportions mean in this weird, broken forest? Are we foraging mice, making use of thimbles for baskets? Actually, that would be adorable and I’m prepared right now to say that’s exactly what the game is, or at the very least what it absolutely should become. I’m only poking some gentle fun here because it’s clear that while the theme is certainly distinctive it’s not at all important to the mechanics. You’re just collecting some cards and trading them in for points. The mushrooms are largely irrelevant to that. They could be gemstones, or classic cars, or bags of illicit drugs. I’m making a thing about the thematic strangeness because really mechanically there isn’t much to talk about– try to get the cards you want before your opponent can deny them to you. That’s not a design space rich enough to give rise to fertile discussion about mechanisms. Both players know how many of the cards are available, and as it’s a game where you use the full deck each time you know who has been collecting what. However, there are so many mushrooms and such a restrictive hand-limit that it’s hard to really execute on a flexible strategy. 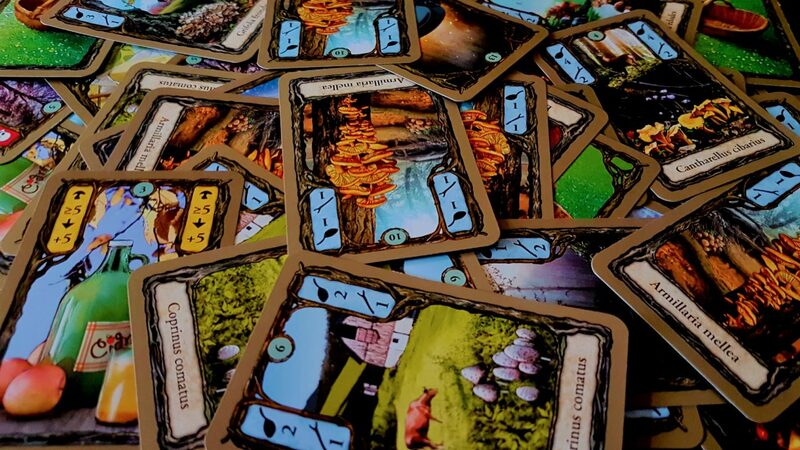 You might want to try collecting the intensely valuable Morchella Esculenta (worth six points each when fried but there are only three in the deck) but if you can’t actually get any more all you’ve done is give yourself a hand-limit penalty for the rest of the game. You have eleven other types of cards you might want to collect, and that’s a significant self-imposed penalty. 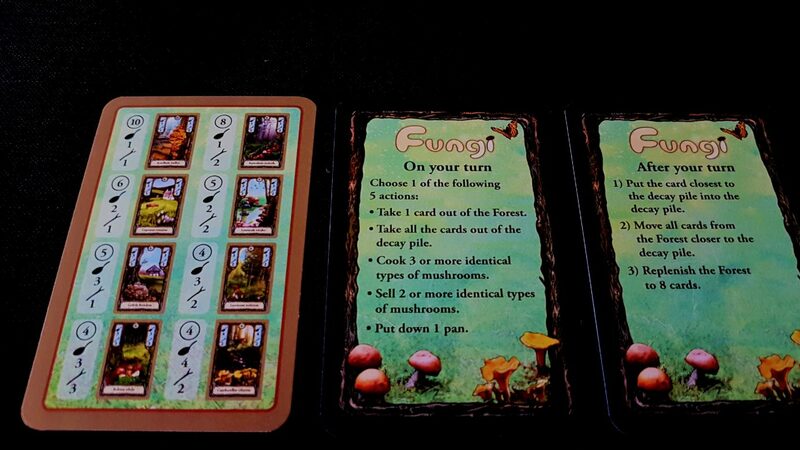 Fungi is a strikingly solitaire experience. It’s also an experience that is curiously detached – it’s algorithmic more than intuitive as you rattle through an internal mental spreadsheet of risk and reward each time you pick up a card. The big plays, such as frying in butter and cider, rarely come along because it’s very difficult to gather enough mushrooms to really make it worth holding the bonuses. Games can be very uneven too because the distribution of pans and baskets can easily be front-loaded or end-loaded. That has a serious impact on the flow of play. Games where pans and baskets are too freely available too early lack serious challenge. Games where they only come into play in the later half or third of the game are intensely claustrophobic. That adds a decent spice of variety into the game, but it also means you’re at the mercy of the deck shuffling when it comes to how much fun you’re going to have. You don’t decide whether the game is going to be fun or balanced, the shuffled deck gets the final say. When I rate games for review purposes, one of the key considerations when coming up with a score is to ask myself ‘how much did I enjoy this’, but also ‘how much did I enjoy this in comparison to another game I could have been playing?’. I say this a lot on the blog, but ‘okay’ really isn’t enough these days. 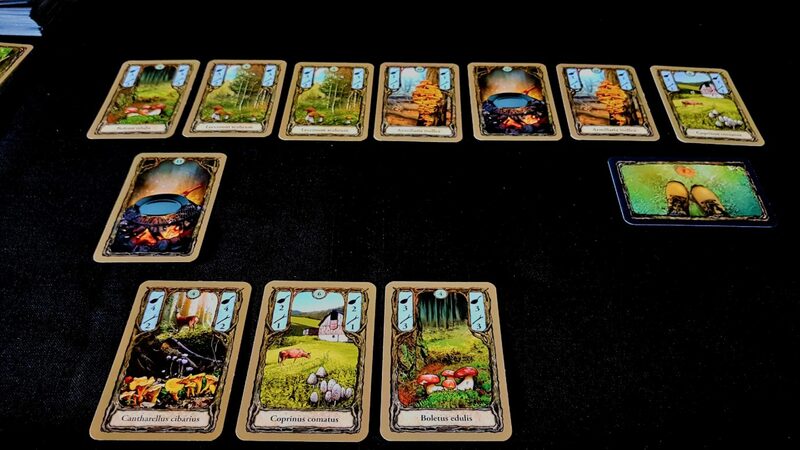 Fungi is a perfectly pleasant way to spend a half hour, but that half hour could also have been spent playing something like Jaipur which would have been an awesome way to occupy the same time period. 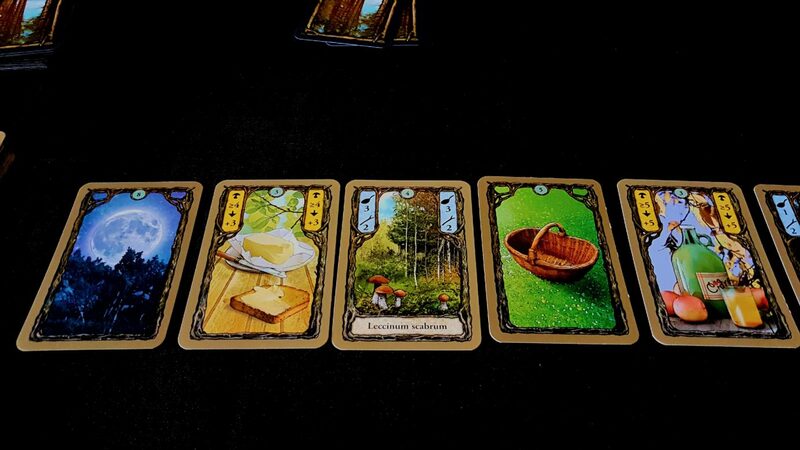 Fungi isn’t a bad game at all, but it’s competing in an intensely competitive marketplace. 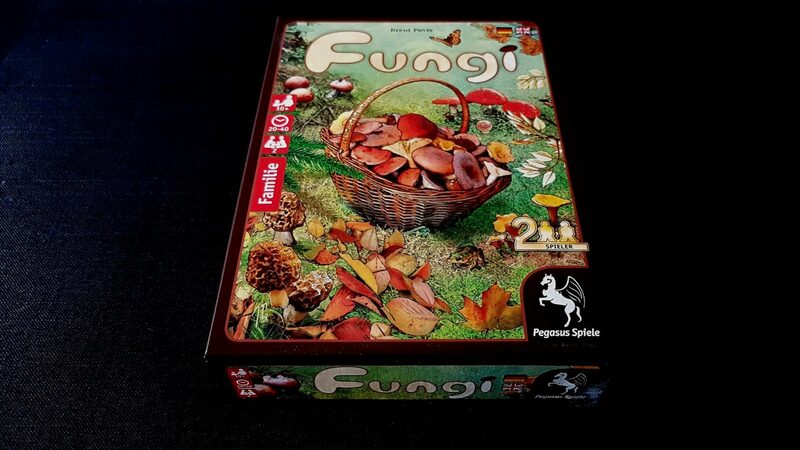 Fungi’s biggest problem is also the one that is least linked to the execution of its design – it just doesn’t have anything that would make me play it over anything else I have on my shelves. There is nothing I can get from Fungi that I can’t get in a more concentrated form elsewhere. Mushroom enthusiasts may feel differently, but Fungi unfortunately is too bland for my tastes. As a mycophiliac whose tastes have been systematically ignored, this game should fill a niche. I wonder if a future expansion will allow players to stumble across random bottles of extra virgin olive oil and shakers full of garlic salt. That really is it exactly – good enough just isn’t good enough any more. If Fungi was the only game I owned, I’d play it a lot and enjoy it a lot. But it’s not the only option I have on my shelves, much less the only option I have available for purchase. The bar is just *so high* nowadays that even fun games aren’t clearing it any more.